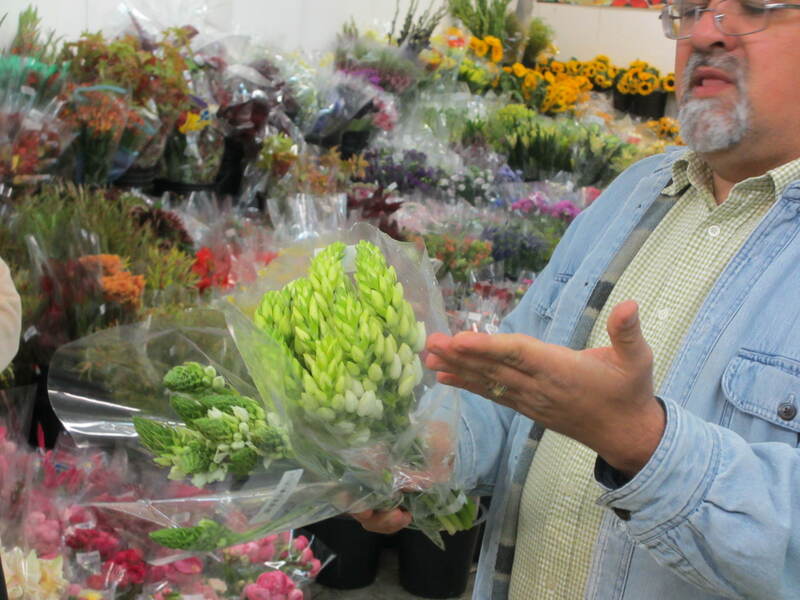 Ever wonder where the flowers in your local grocery store or florist came from? Flowers are grown all over the world in countries like Holland, Chile, Japan, Columbia and Ecuador, just to mention a few. 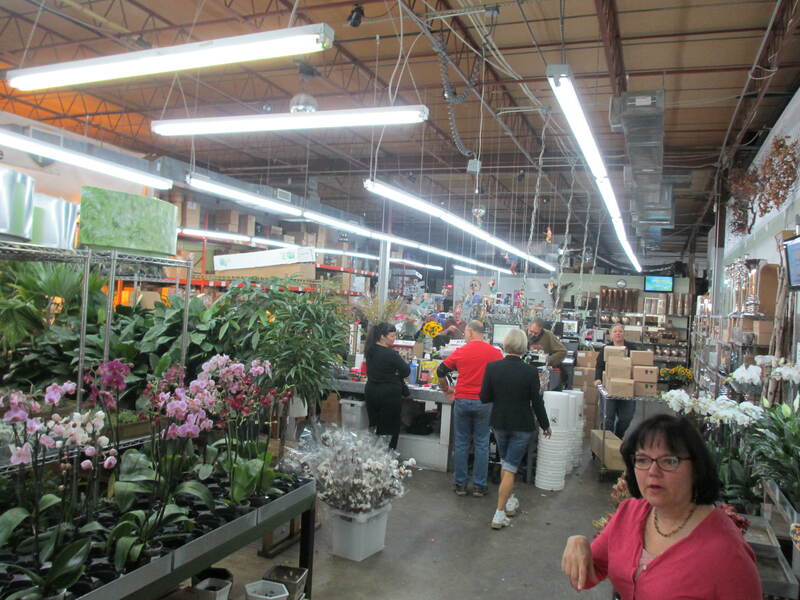 I toured Cut Flowers Wholesale, Inc. in Atlanta, Georgia during my trip to Flower School. We were given a very informative behind-the-scenes tour. Maybe I’m a nerd but I have always been intrigued by behind-the-scenes stuff. I even liked touring a Caterpillar plant during college (yeah, as in the tractor & dump truck company!). The flower industry is one amazing production. It all begins with the flower growers around the world. Cut Flowers works very closely with growers in Chile. Our guide explained that they have helped the Chilean farmers develop specific colors of peonies based on the demand in the United States. Brides don’t necessarily want pastels in the Fall or fall colors in the Spring. Over time, the Chileans have begun producing their flowers based on preferences like this and on recommendations from Cut Flowers. Before this tour, I thought peonies were only available for a very short period of time in the Spring. But apparently there is a second peony season in the Fall. We saw a batch of gorgeous coral/pink peonies that had just come in! Wow! 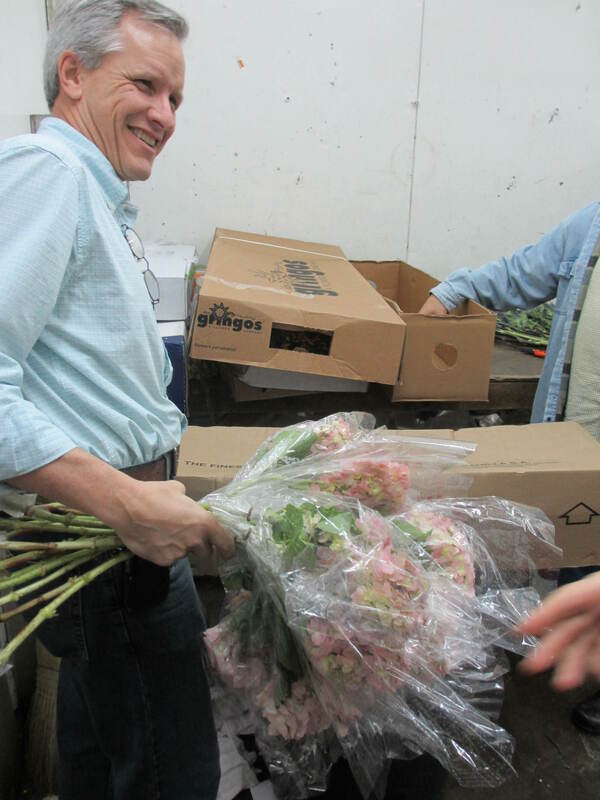 Once flowers are picked and packaged by the growers, they are either shipped directly to customers like Cut Flowers or sent to auction houses. I’m told that flower auction houses are much like the NYSE. Can you even imagine an environment like that just for flowers? I have been to the NYSE and hope to some day visit Aalsmeer in Holland. It’s the largest auction house in the world. It’s also one of the largest buildings in the world. Talk about flower heaven! Check it out here. 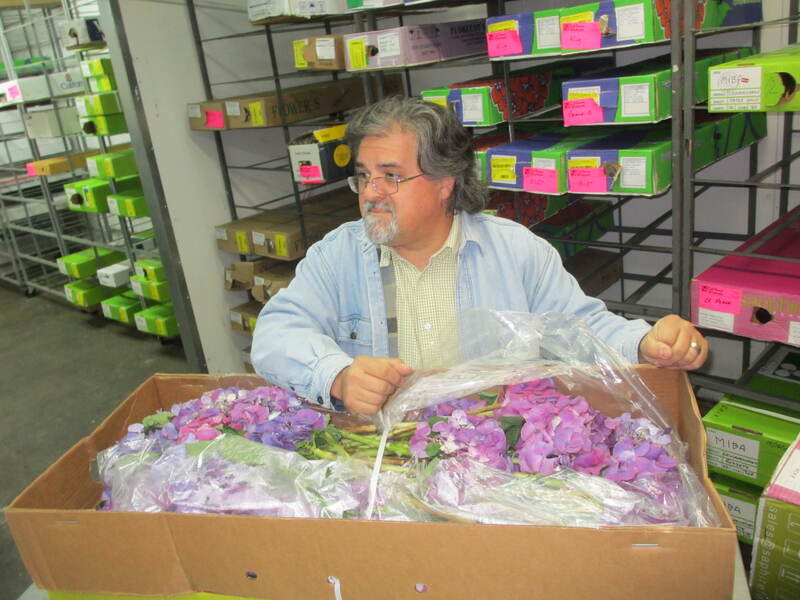 Flowers, just like other imports, must be inspected by the U.S. Department of Customs. Miami, Florida is the major inspection check point in the U.S. for flowers. The flowers are checked for quality, bugs, disease, etc. If the inspsectors see a bug of unknown species, the critter must be sent up to Washington, DC for inspection. If the bug is on the “OK” list, the flowers are either sent on their way or they may have to be fumigated. Not all flowers can withstand the fumigation process which calculates into a financial loss for the growers and purchasers. 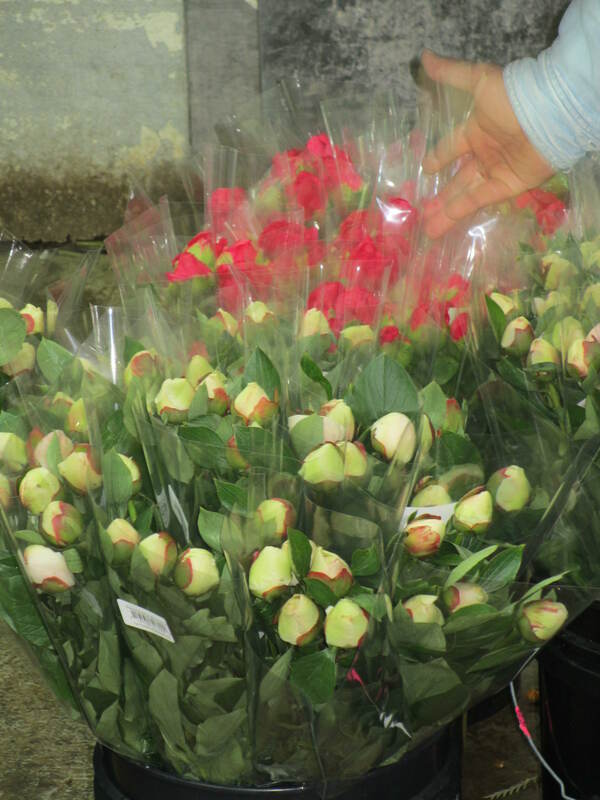 Once the flowers get the seal of approval from customs, they are loaded on planes or refrigerated trucks and shipped all across the country. 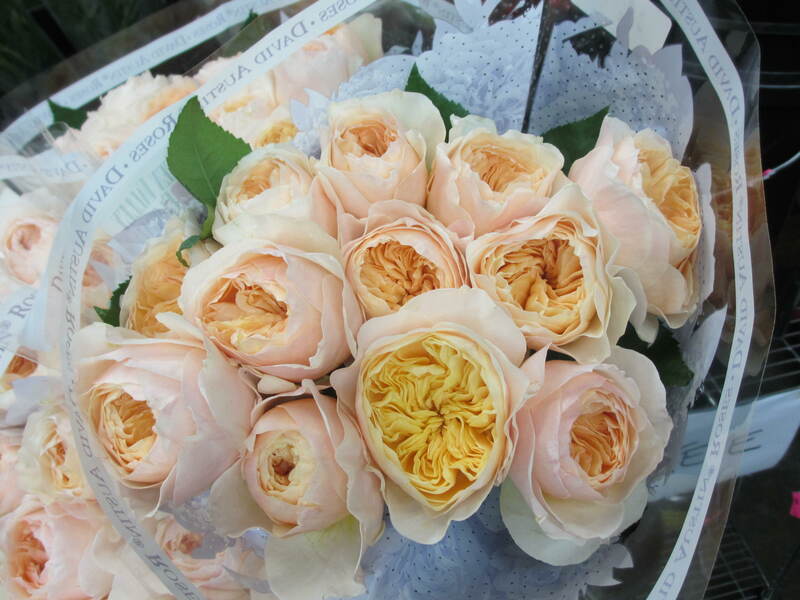 Typically, Cut Flowers receives its flowers within 24 hours of hitting US soil. When you think about everything involved in this process, that is an incredibly fast turn around. 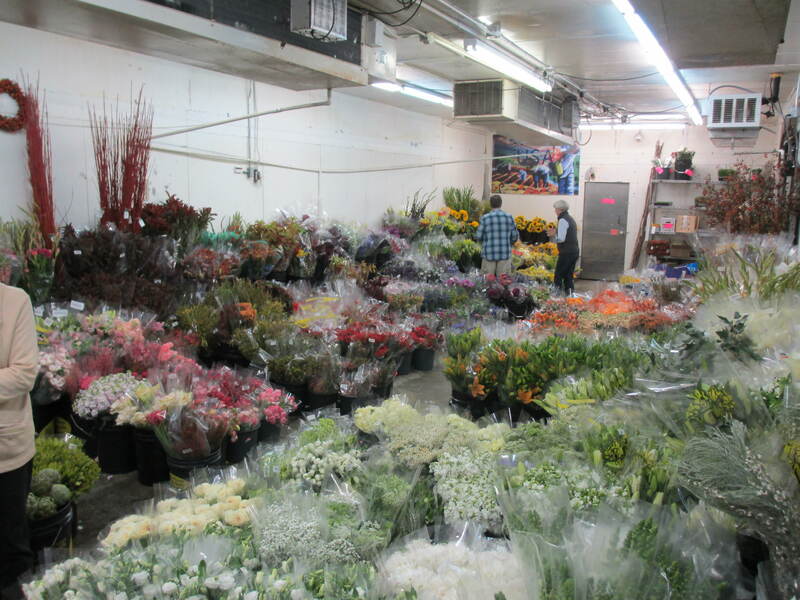 Flowers arrive at Cut-Flowers around the clock on refrigerated trucks in what is called “dry-pack”. Basically, the flowers are packaged without a water source; hence the name “dry pack”. 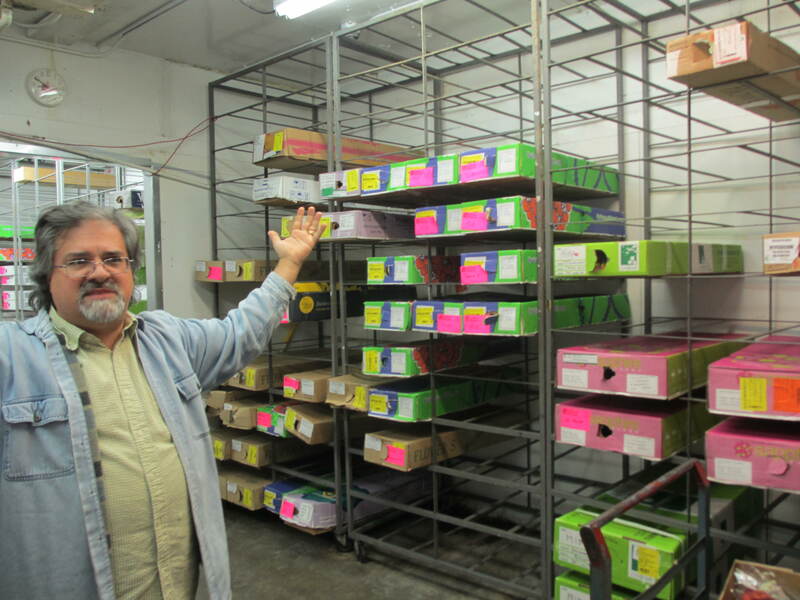 Our guide took us into the cooler where the dry-packed flowers are stored on specially constructed shelves. The cold air is allowed to circulate between the cardboard boxes to keep everything at the right temperature. The cooler temperature while we were in there was set at 38 F. This cool temperature is essential for preserving the flowers and halting the maturing process. The air circulation between boxes is equally important since flowers are packed in cardboard boxes. Cardboard is like compost. It produces heat which of course is detrimental to flowers and speeds up the maturing process. I also learned that the holes on the ends of each flower box are NOT nice little handles there for my convenience. They are actually used during part of the cooling process. The handlers (either growers or wholesalers) hook up cooling machine tubes to the boxes and blow in freezing cold air to instantly drop the temperature and halt the maturing process. 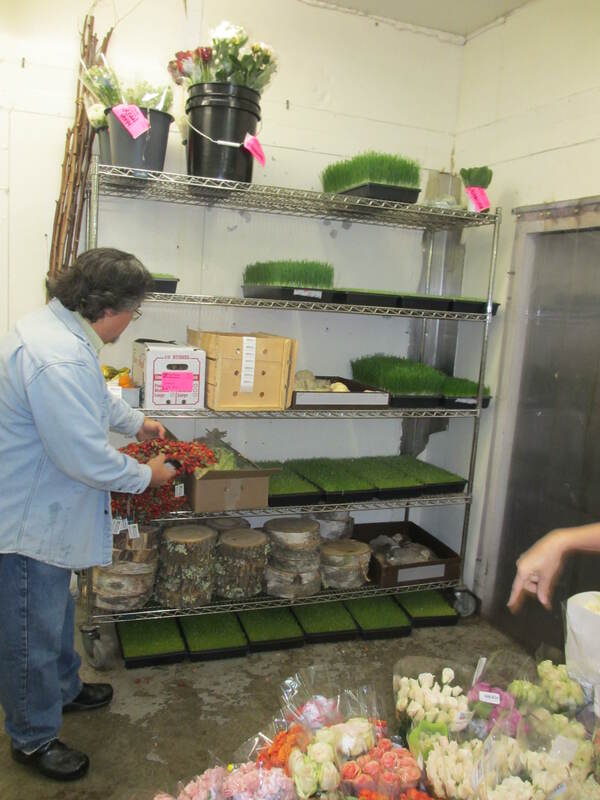 After the flowers are delivered to Cut Flowers, they are processed by hand in another cooler, as needed depending on the needs of the flowers. Some types of flowers can stay dry-packed for a much longer period of time than others. Some flowers need to be cut and hydrated right away. I was way too cold to take many notes so I can’t remember examples to give you. It was only 38 degrees in the cooler after all!! We saw so many beautiful varieties of flowers including everything from the amazing David Austin roses (there are only 5 authorized growers in the whole world), to leucadendron, Israeli Lisianthus & Star of Bethlehem (huge difference depending on the production country!! 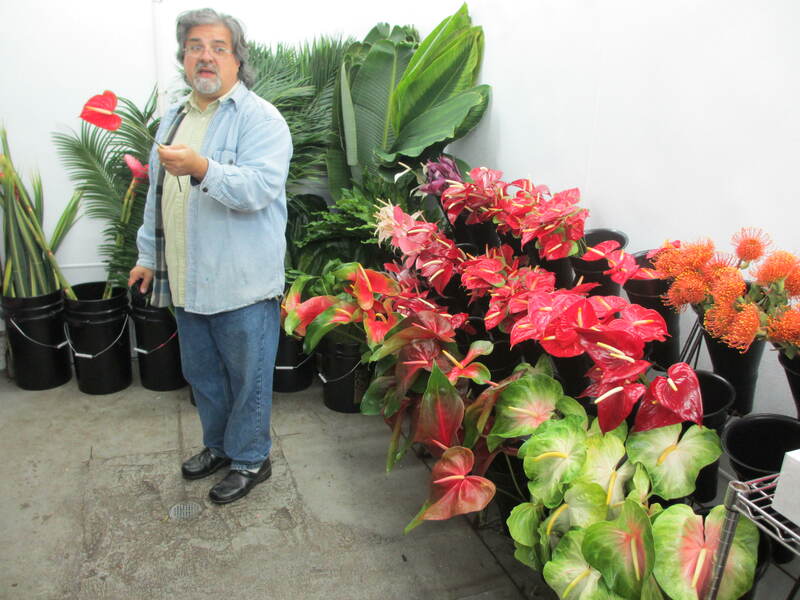 ), a wide variety of greeneries, an amazing tropical room containing anthuriums, orchids, pincushions, HUGE 5 foot tall gingers, greeneries, etc! They even had a “natural” section with slices of wood, moss, pumpkins, and rosehip wreaths. I would LOVE for the local wholesalers in my area to carry a selection like this. Cut Flowers organizes the cooler according to color instead of species. What a great way to find what you’re visualizing! Star of Bethlehem. Notice the contrast in the two packages – the Israeli Star of Bethlehem (right) was lush and huge compared to its South American counterpart (left). 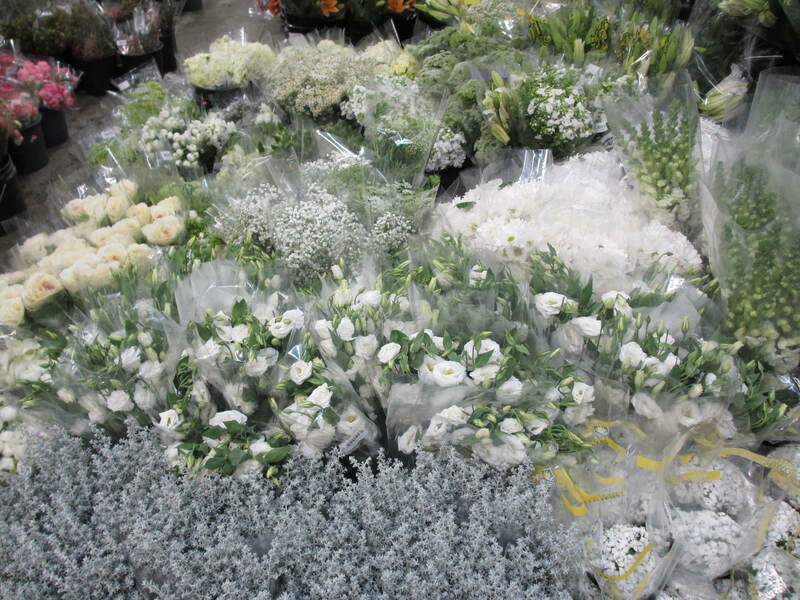 In addition to flowers and plants, floral wholesalers stock ribbon, containers, and floral supplies. I was drooling over the inventory Cut Flowers carries! My friends in Atlanta have an amazing resource in Cut Flowers. They do ship overnight via UPS & Fed-Ex so I look forward to working with them in the future. They also have an extensive flower gallery on the website so check it out and learn about different varieties of flowers, berries, and greens. Here is a link to the flower gallery.Once flowers are processed, they have a relatively short life span. A good wholesaler rotates its product frequently and keeps only the freshest flowers available for florists like me. I’m sure we only brushed the very tip of this process but I was fascinated and slightly overwhelmed with the sheer magnitude of the flower industry. Flowers organized by color in the cooler. So, the next time you complain about the price of flowers at your local florist or grocery store, take a second and remember how much care and handling was involved in ensuring that your flowers 1) grew 2) stayed fresh and 3) arrived looking beautiful so you could ENJOY them! I don’t know about you but I tend to appreciate things more when I know what all is involved in making something happen!